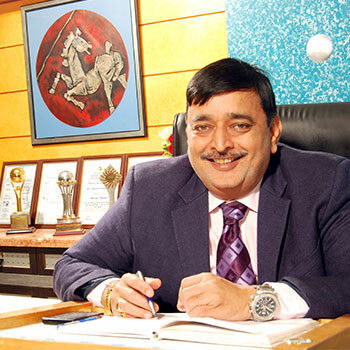 A Technocrat, energetic founder and the director of Gopinath Chem - Tech Ltd Mr. Bhupen Shah had vision of making a company in 1989 which can steer globally and domestically. Today with his leadership quality, enterprising nature and extremely dedicated attitude towards his organization, he has made an excellent model of the company which works in harmonized mode. Revenue and stature is being trusted by global giants which is the reason why GCL is reckoned as well managed, value created, and internationally reputed company. With a deep insight, he has made multi Business Corporation like GCL which is rising star of modern era chemical industry. THE TRUST BESTOWED BY GLOBAL GIANTS IS ONE REASON WHY THE COMPANY HAS GROWN ENORMOUSLY BOTH IN REVENUE AND STATURE. I, Mr. Bhupen Shah express my sincere thanks to all our esteem patrons, who have supported and helped us in many ways in making of Gopinath Chem - Tech Ltd’s enviable success story in the world of dyes & dye intermediates. The goodwill we cherish today is built over a period of time with all our rigorous efforts. We are here to maintain it forever. After the hard and sincere efforts made in many years Gopinath Chem - Tech Ltd. has created a strong and positive mark on both domestic and international arena. The success of Gopinath Chem - Tech Ltd. is backed up by our dedicated, skilled and highly trained work force and team. A group of highly qualified technocrats and chemists in the well equipped plant and laboratory are behind very high quality and standard of the finished products. In our state of art plant, intensive process control at various stages of manufacturing as well as with strong alignment of high grade raw materials supplied by our associated agencies, enable us to produce un-surpassed quality oriented final products and stringent testing that ensures uniform and consistent quality desired by the customers. A highly flexible pilot plant backed by R & D laboratory has been established at our GCL Unit-II Chhatral works for providing prompt technical services to the customer’s satisfaction and desire which is essence of the Gopinath Chem - Tech Ltd’s policy towards their precious clients. As a result, Gopinath has been able to combat competition by consistent quality improvement and product development. We have surpassed changing market scenario with our large series of Dye & Dyes Intermediates products to achieve exact chemistry of our customers. As a president of Gopinath Chem – Tech Ltd, I take this opportunity to further promise to repay the trust and goodwill you have reposed in us over the years and I, personally, and on my company’s behalf assure you to work hard to ensure a well balanced performance and lift Gopinath Chem - Tech Ltd. to the higher rungs in the ladder of success and pose Gopinath as a reliable organization having international reputation in the area of global dyes and dye intermediates industry. I look forward to have your best co-operation and rewarding association in all our future endeavors.